The below information will help you resolve most problems. If you are still experiencing difficulties please contact us during normal business hours and we will be glad to help you further. Inks are bleeding/washing out of the transfer (OEM inkjet inks) More. This can be for a few reasons. First make sure you are not printing your image with more than 200 DPI. Too much ink can cause the inks to bleed. For best durability use a 50% cotton / 50% polyester shirt. If you are using inks from certain brands such as HP or Lexmark, etc these inks do not tend to hold up well in the wash. Consider using our PRO-FLO / Armur Ink system with one of the recommended Epson printers on our website. Why is setting image resolution so important? More. For inkjet printers it controls the amount of ink the printer will lay down. Too much ink can cause the inks to bleed. Textiles such as t-shirts, mouse pads, tote bags, caps, etc cannot hold more than about 200 DPI (dots/pixels per Inch) so printing at a higher resolution will only cost more in inks, take longer to print and can cause the inks to bleed. For laser/CLC printers the same holds true. What typically happens if you lay down too much toner is the toner tends to flake off the transfer paper. Again, printing at a higher resolution above 200 DPI will only cost more in toner, take longer to print, create flaking of the toner as well as washability issues. Is 200 DPI enough resolution to capture all my details and image characteristics? YES, if your are applying transfers to a fabric item! In fact some images such as solid text or graphics could be printed and even lower resolution and you will not see any noticeable difference once applied to the fabric. Why can't I set the image resolution in my printer control driver panel? Printers do not have the ability to set the exact DPI. Typically printers have selections such as Draft, Text and Photo Quality. Even when set at the lowest quality (ie: draft) this is still above 360 DPI. Keep in mind printers are designed to print on paper. Paper holds much more resolution (DPI) than what's needed for heat transfer printing and because these transfers ultimately end up on a fabric surface the resolution should not exceed 200 DPI. Washing Instructions for standard digital transfers (non-sublimation) More. Wash garment inside-out. Machine wash in warm or cold water. Do not use fabric softener or bleach. Tumble dry on low setting. Do not dry clean. My heat transfer for standard printers (non-sublimation) does not release properly More. The transfer process was not completed. One of the three elements has been set too low. If using a heat press (or see home iron instructions below) start by making sure the pressure on your heat press is set properly (heat press should snap shut very firmly). Pressure should be set to medium/high. If the pressure is ok, try increasing either the temperature or the time duration. See transfer paper instruction sheet for recommended times and temperatures for specific products being pressed. Most common time settings for our digital transfer papers when applying to mouse pads, t-shirts, caps, etc are about 5 - 8 seconds. Peel transfer immediately. Do not let cool! For home irons: While following the directions that came with the transfer paper here are some additional things to remember. Make sure the iron is dry and has no water in it. Set iron for hottest setting. Some home irons do not get hot enough. You can take tin foil and place it under the item (ie: t-shirt, mouse pad, etc) this will help to trap the heat and increase the temperature. My colors on the transfer do not match what is on my screen More. This problem is most commonly caused by using incorrect software or printer drivers. Ensure that you are using the proper software. If you are printing with our Sawgrass sublimation inks make sure you have loaded the "PowerDriver" software on your computer. Keep in mind that computer monitors are not color calibrated. There will always be some difference between what you see on the screen and how it looks when printed. Note: When printing with sublimation inks it is normal for the transfer to look washed out or dull. When the transfer is applied with the heat press the colors will bloom and come alive. Which side of the transfer paper do I use? More. You need to print on the front or the coated side of the paper. Our heat transfer papers that are sold for standard printers (ie: inkjet, laser, etc) have a back print on it. If you are printing with sublimation inks on sublimation transfer paper you will print on the bright white side. My heat press is stained with inks / I put the transfer in upside down More. For cleaning your heat press we have two products that work very well. For regular cleaning maintenance we recommend Ez-Off and for heavy duty cleaning Hot Metal Cleaner. See this link https://www.bestblanks.com/heat-press-accessories.html for these items. Use a 3M type scrubbing pad (not too course). Be careful not to scratch the heat press surface or wear off the Teflon coating if your press has one. It may require a bit of elbow grease until you remove all the inks. Here's how to avoid this from happening again: Use a Teflon sheet to protect the upper heating platen by placing it on top of the product/transfer. To protect the bottom heat press platen use a Teflon pad protector. This not only keeps the press clean it will make it much easier to slide shirts on and off the press quickly. 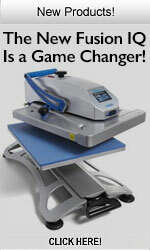 Keeping your heat press clean and performing properly is very important. See this link: https://www.bestblanks.com/heat-press-accessories.html for these items. Inkjet inks turn dark, have a yellow/brown tint after application More. The transfer is being burned. First make sure your temperature is set correctly and that you are not pressing it for longer than the recommended time. Typically, the time and or temperature need to be reduced. If your printer is using Epson Durabrite, Ultra Chrome or other pigment ink: These types of inks are very durable and produce excellent results. However, some changes need to be made in order to correct the yellowing or discoloring of the ink that you might experience after heat press application. 2. Increase time to approximately 8-15 seconds. 3. Make sure your image resolution is no higher than 200 or 250 D.P.I. max. (This is for all textile items) Don't worry you will still get photo quality results! Anything over 200 DPI is overkill for textile printing. 4. “Color Balancing” your image in a quality software program such as Adobe Photoshop® would be a great help to provide professional quality imaging results. Setting image resolution for transfer printing with Inkjet and laser printers More. All fabric items such as mouse pads, shirts, etc make sure your image resolution is no higher than 200 or 250 dpi max (this is for any & all textile items). You need to set this resolution in your graphic program (ie: PhotoShop). Standard print drivers that come with the printer typically go as low as 360 dpi. General Info for digital transfer papers (Inkjet & Color Laser Printers) More. BE AWARE: All heat transfer papers DO NOT work the same. The instructions are different for different brands of paper, sometimes drastically. ALWAYS follow the instructions that are SPECIFIC to the paper you are using. If you do not have a set of instructions, DO NOT use instructions from another brand of paper. Instead, locate the paper you are using on our website and click the link that says “Application Instructions” or contact us and ask for instructions to be faxed or e-mailed to you. There are 3 basic elements to getting a good result, TIME, TEMPERATURE, and PRESSURE. When these 3 elements are balanced properly you will get professional quality results every time. This is not hard to do. Heat transfer paper wrapped around fuser section inside laser printer / melted around fuser section More. First it should be noted that our laser heat transfer papers are intended for color laser printers only. It will melt in a black and white laser printer because these type of b/w laser printers run too hot! If you have a color laser printer, first make sure you have ordered the correct type of laser heat transfer paper for your type of laser printer. See our web site for details. Chances are you put the transfer paper into the laser printer upside down and did not realize it. Some laser printers will flip the paper over inside the machine where you can’t see it. Try running a piece of ordinary paper through the printer and before placing the paper into the tray, mark a large “X” on the paper with a pen. Print any image as usual and when the paper exits the machine, you will know for sure. How do I use the 2 step Opaque Material? More. 1) Print your heat transfer using our “TransferJet”, “Premium” or “PremiumPlus” transfer papers (see below instructions for the “High Temp Laser” paper). 2) Place your printed heat transfer over the opaque material, image side down, on top of the fabric surface side. 3) With a heat press apply approximately 370°F for about 3-5 seconds but do not peel the heat transfer sheet yet! 4) Trim out the un-printed area of the combined papers. Leave approximately 1/8” of an inch around the image. Production Tip: It is not practical to weed out the image (ie: cutting around letters, objects, etc). This would be very difficult and time consuming to do and the material will fray. We recommend adding a background color or border to your image so your designs becomes square, rectangular or a triangle and therefore lends itself to cutting straight lines using a straight edge and a razor. 5) Peel off the backing paper from the opaque material and place (sticking side down) over the garment. Press the combined paper for 5-8 seconds at moderate pressure at approximately 370°F. After pressing peel off the top heat transfer sheet immediately. Try to peel paper straight back so that the garment does not lift. Using “High Temp Laser” Heat Transfer Paper with "Opaque Material" More. 1) For best results print the “High Temp Laser” paper as described above. 2) Set heat press at 400F. 3) Set pressure on heat press, to close firmly. 3) Apply the “High Temp Laser” paper to the Opaque material for no more than 3 seconds with a heat press. 4) DO NOT PEEL THE PAPER YET! 5) Trim image as described above in the Production Tips section. 6) Peel off backing paper of Opaque Material and place the (combined) transfer over garment. 7) Press for approximately 5-10 seconds and peel the top transfer paper immediately. Get a first class finish on shirts with our coated transfer papers More. This will remove the bulk of the coating before it is applied to the shirt. The reaming edge of the transfer will not be noticeable and even that edge will disappear after the first wash. This also helps give the shirt a softer hand. Should I trim the heat transfer paper before applying it to mouse pads? More. For mouse pads you do not trim the transfer paper. Mouse pads are printed using the entire transfer sheet (if using a 8.5"x11" sheet). The heat transfer should cover the entire surface of the pad. With our heat transfers when you peel the heat transfer off it will leave a clean edge! Just set the image up so that it is larger than the mouse pad by approximately 1/4" on all sides. Any important elements such as text, logos, etc should be approximately 1/2" away from the mouse pad edge. Best for permanency and washability. Press for 5 seconds to remove moisture. Use Teflon sheets inside shirt to prevent ink "blow through." Use Nomex/felt pad. Place transfer face-up on lower pad and tile face down on transfer. The thicker the material is, the longer the transfer time will be. Peel away protective coating. Use heat resistant tape to hold transfer in place. Remove all slack from transfer around mug to avoid creasing. First... sublimation transfers look faded before they are applied under the heat & pressure of a heat press (you cannot use a home iron). The colors bloom when heated. Streaks in the printouts can be caused by a dirty print head. There are several ways to initiate a print head cleaning on Epson printers. For complete instructions on print head cleaning, please see your Epson manual. Problem 3: My nozzle check does not print correctly. The print head may need to be cleaned, if the nozzle check shows gaps. There are several ways to initiate a print head cleaning on Epson printers. For complete instructions on print head cleaning, please refer to your Epson manual. Problem 4: Black does not transfer as a good, rich black. Remember: Dye-sublimation is a time sensitive procedure and each heat press and each production environment will have its own unique properties. Small adjustments may be necessary to achieve optimum results. Problem 5: My transferred image looks blurry. Another common cause for blurry images is not using the recommended sublimation paper. Problem 6: The paper sticks to my mugs. This problem occurs due to softening of the coating when the mug is heated during the transfer process. To reduce the effects of the softened coating, remove the paper from the mug before cooling. If any residue remains, you may clean the surface of the mug with rubbing alcohol after it has fully cooled. Problem 7: I get an error message when I print with Powerdriver. Low hard drive space can cause a spooling error when using Powerdriver Pro. Check your hard drive to make sure that you have at least 100 MB of free space. Refer to your computers’ users guide for assistance. If you do not have 100 MB of free space, delete unused files to make more space available. A spooling error message may also occur while printing, if Powerdriver Pro and the Epson printer driver are not set for the same LPT port. Verify that both drivers are set for the same LPT port. If the printer does not have the appropriate name, Powerdriver Pro will not work correctly. Ensure “copy 2 “does not appear after the printer name. If your printer is named something other than what is listed above delete the printer and reinstall it from your installation disk. Ceramic Tile Application Instructions: More. 1) We recommend that you have a Teflon Pad protector to keep the lower pad clean from ink blowing out the sides of the transfer. 2) Place 1/2" Nomex Felt on top of lower platen. 3) Place transfer image facing up on top of Nomex Pad. 4) Place ceramic tile facing down on top of transfer. 5) Place a protective Teflon Sheet over transfer to protect upper heat press from getting scratched! Ceramic tile can be pressed face up or face down. For best results face down is a bit longer to apply but you will achieve better results. Ink manufacturer, heat press pressure, number of tiles per press, if the tiles are pressed face up or face down, etc. Note: You can also use Heat Conductive Rubber instead of a Nomex Felt Pad. However, the Nomex pad will give you more consistent results. Instructions For Sublimating On Glass Cutting Boards & Glass Tiles: More. Although presses and pressing styles vary, hopefully this will provide you a general guideline for successful sublimation on our glass. Which side do I press on? As there are two finishes, both the white and the frosted, on both of them you press on the coated side, (white side). Not the clear glass side. Do I reverse the image? No you do not need to reverse the image as you will be looking through the glass to the image. Make sure not to “reverse or mirror” the image. What time and temperature do you recommend? We suggest a starting point of 400 F and 6 minutes for the “frost” glass and 7 minutes for the white glass. Can I drop them in water to stop the sublimation process after pressing? Yes, as this glass is tempered, if you prefer you can dunk the glass tile in water to stop the inks from blooming. Stopping the inks from blooming gives better results. What is tempered glass and why do you use it? Tempered glass is flow glass that has gone through a heat treatment process. This process dramatically increases two major factors of the glass. First is safety. When the glass is fractured, the glass fragments into small relatively harmless fragments. Second is strength. Tempered glass is approximately four time stronger then annealed glass (plate glass) and can withstand temperature changes of 200°-300°F. Can tempered glass be cut or drilled? More. No, however if you have a particular application that required it to be drilled or cut we can supply you with that type of glass. Glass Tiles/Cutting Boards are sublimated On the (white) back side. 3) Cutting board/glass tile goes on press with the white side up. 4) Place transfer paper image side down. 5) Some people prefer to use the green heat conductive rubber on top of the transfer to give a more (squishy) even pressure. Note: DO NOT USE A Nomex pad (Nomex is only for ceramic tile production). Ceramic Plates Application Instructions: More. 6) Aluminum Tray, with black circle stuck onto tray. This assures that the plates will not dig into the main rubber pad of the T-Shirt press and dig a circle into the main pad, ruining it. It is also a quick template/tray that immediately drops onto the table and centers the plate under the plate attachment. The customer sticks the black pad on it. Suggested pressing temps & time: 400-F for 5 mins. Add/subtract time depending on results. Light to medium pressure - black support pad should compress 1/2-way, without breaking plate.